The tensions between China and Japan can be understood as a contest of “shih,” or strategic configurations of power. So far, signs of reconciliations between Beijing and Tokyo are still nowhere to be seen. Instead, both seem to be winding up national springs to get prepared for a possible conflict. Abe, shortly after being rejected and denounced by China for his confrontational remarks made at the World Economic Forum, repeated his ambitious goal of reviewing Japan’s right of collective self-defense in his January 24 policy speech to the National Diet. China, geared up to check Abe, has never stopped its strategic preparations. The establishment of China’s Council of State Security may suggest that, at the top level, China is taking full advantage of the current circumstance to “stretch its arms” to tackle various traditional and nontraditional challenges, which of course includes the enduring deep-rooted disputes with Japan. This is only a tiny segment of the current wrangling between Beijing and Tokyo. If we look at East Asia’s political map as a Go game board, China and Japan are rival players running into a deadlock, both holding their strategically important game pieces. The following are some of the most important ones, which may help to understand and compare each country’s strategic configuration of power. New type of great power relations with the U.S.: The structural distrust between China and the U.S. more or less undermines a quick solution for Sino-Japanese disputes, and the U.S. never hesitates to claim Japan as a truly important ally. However, building a new type of great power relations has been a point of consensus between Beijing and Washington. Such confirmations have been made by high-ranking officials from both sides on several occasions, regardless of China-U.S. distrust and the discomfort brought by the Sino-Japanese standoff. Beijing may have reasons to believe that the importance of China-U.S. relations could help it to gain a little more strategic weight, but Beijing must play the game more carefully and skillfully. Ever-growing economic power: China’s GDP in 2013, according to Asahi Shimbun [Chinese], was almost twice that of Japan, even though China just passed Japan to became world’s second largest economy in 2010. With this ever-growing economic power, which is expected to continue expanding in the coming years, China is modernizing its military and especially its air force and naval fleets. Its civilian marine surveillance fleet is also getting bigger and heavier as China aims to build a 10,000 ton marine surveillance ship – the world’s largest such vessel. Historical empathy from other states: During the recent public opinion offensive in world media, Chinese diplomats strongly emphasized the importance of the global order built after World War II. So far, this public opinion offensive seems to be a relative success, particularly in Europe, where people have very vigilant attitudes towards war crimes. At the Davos World Economic Forum, Chinese Foreign Minister Wang Yi tried to reach to his audience by noting that to show respect to and to mourn Nazi war criminals in Europe would definitely be regarded as an inappropriate or probably even illegal deed. Japan-U.S. military alliance: Specifically, Article 5 of Japan-U.S. Security Treaty, which may apply to the Diaoyu/Senkaku Islands, has been a pain in the neck for Chinese decision-makers. However, it is still not crystal clear how deeply the U.S. would be willing to be dragged into a possible Sino-Japanese conflict. Furthermore, it is clear that the U.S. does not want Japan to make further disruptions to its East Asian policy as a whole. Hence Washington expressed “disappointment” after Abe visited the war shrine and sought to get assurances that Abe wouldn’t repeat the visit. “Three Arrows” of Abenomics: The Japanese economy has been struggling since the early 1990s, at the same time as China has truly emerged as an economic great power. Aiming for a revival, Abenomics promised reform measures in the banking system, government budget, and private investment. However, Satyajit Das, the author of Traders, Guns & Money, claimed in September 2013 that “Abe’s ‘three arrows’ will fall short of the target once again,” since “Abenomics really is more religion than reality.” Entering 2014, Japan’s economy expanded only by 1.1% and actually looks weaker. Abe’s “Proactive Pacifism:” Abe’s determination to step away from Japan’s post-war pacifism, which he believes is too excessive, will be a very complex issue. China’s military buildup might give Japan a chance to find a rivalry that will help Abe sell national normalization, which could help to maintain the regional balance as U.S. influence in the region is relatively declining. However, the U.S. may also have reasons to worry about how far Japan wants to go. Abe claims he embraces “pacifism,” but he definitely “seeks more muscle,” as a recent New York Times headline put it. What does Abe’s “proactive pacifism” preciously mean to Asian neighbors that suffered from Japanese imperialism during the wars, such as China and South Korea? Japan may still have a lot to explain. Is China Winning the Game by “Shih”? U.S.-China relations and U.S.-Japan relations are two of the most important bilateral relations in contemporary world politics for the U.S., particularly as it tries to rebalance to Asia. However, seeing China as a strategic competitor and insisting on Japan’s role as an important ally does not necessarily make the U.S. overlook the possibility of building mutual trust with China and the importance of cooperating with China on many issues that have global and regional significance – the North Korea nuclear issue, for example. What’s more, should China’s economy continue to expand at a robust rate, the U.S. will sooner or later lose its position as the world’s largest economy. 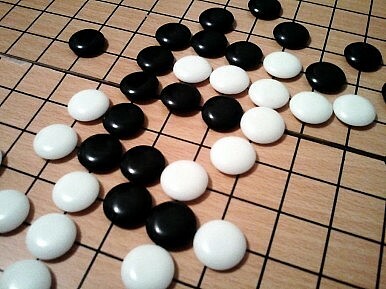 The dispute and rivalry between China and Japan, currently the world’s second and third largest economies, would become a game between Number 1 and Number 3. Hence, so far, it might be appropriate to say that China is gaining a temporary upper hand. Japan, however, is acting a little more passively, for example only fighting back in the world media after Chinese diplomats had initiated a global-scale PR offensive. China’s “three game pieces” vs. those of Japan briefly explain how China strives to win over Japan through a more effective strategic configuration of power. But this doesn’t mean that China will win the game for sure. The current Sino-Japanese standoff comes from the deep-rooted disputes between these two neighbors, which include very complex historical, territorial, economic, and political issues. The role of the U.S. inevitably has made the situation even more complicated. Therefore, a rivalry between China and Japan, is actually to a certain degree a trilateral game among China, Japan, and the U.S., and this game is still ongoing. China lambasts the new guidelines, and the entire U.S.-Japan alliance, as a relic from the Cold War. Afghanistan has a long and difficult road to transition from an aid dependent economy to a trade and transit economy. Israel Balancing US-China Relations: Geostrategic ContextIs Vietnam Creeping Into a Succession Crisis?US-Japan Trade Agreement Negotiations: Why Now?What Does Jokowi’s Win Mean for Indonesia’s Economy?The US Is Pushing Back Against China. What Happens If We Succeed?